Are you tired of your laptop automatically going to sleep when you shut it’s lid? Here’s how you can make your laptop do what you want it to do when you’re ready to put it up. Please Note: Do NOT put your laptop in its bag while its running, as it will almost certainly overheat. You have been warned. Thankfully, it’s easy to change the settings. 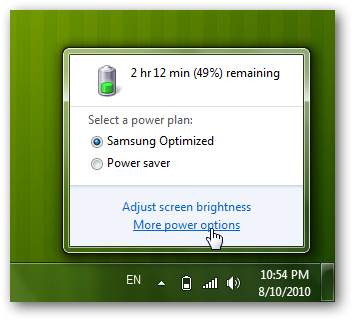 Simply click the battery icon in your system tray, and select More power options. 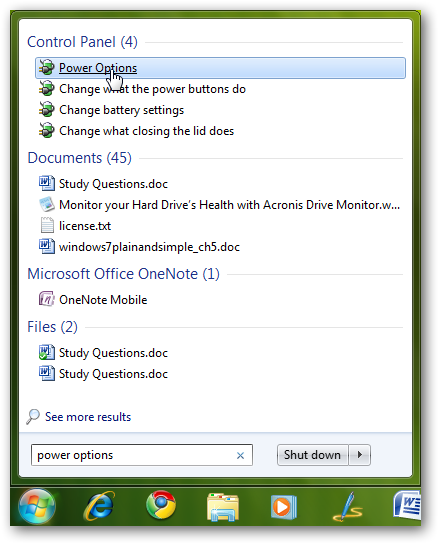 Alternately, you can open the Power Options window directly from your Start Menu search. In the Power Options window that opens, click the Choose what closing the lid does link on the left sidebar. 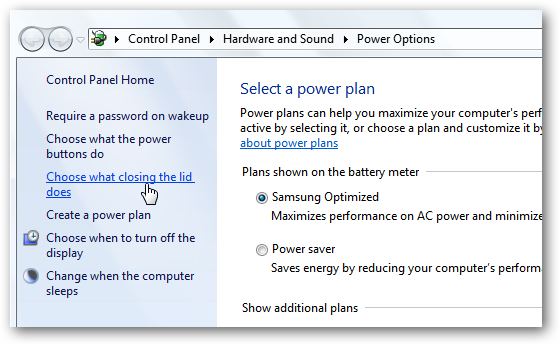 Here you can choose what your power buttons do on your computer, as well as what happens when you shut the lid. 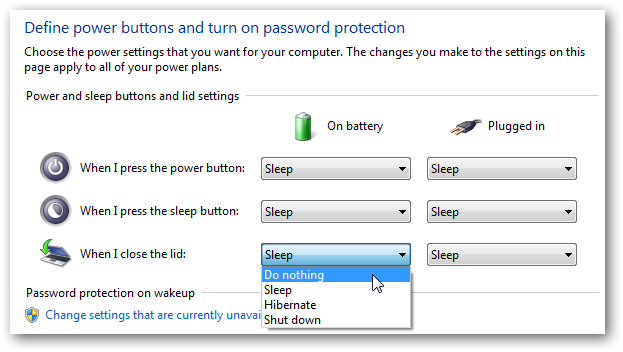 You can select to Do nothing, Sleep, Hibernate, or Shut down. In general, Sleep is a good option, but if you want to leave your laptop running, select Do nothing. Note that you can change the settings for both On battery and Plugged in, so your laptop will work differently when you’re using mobile versus when you’re plugged in at your desk. Since we usually would only want to leave our laptop running when it’s plugged in, we set ours to still go to sleep when it’s on battery power but to do nothing when you close the lid while it’s plugged in. Very handy. Underneath you’ll notice a couple more settings, though they’re protected by default. Click Change settings that are currently unavailable to change them. Now you can choose whether or not you want your computer to require the password when it wakes from sleep mode. Once you’re done, click Save at the bottom to start using your new settings. If you want to switch back when you’re on the move again, just repeat the steps and set it like you like. Now you’re in full control of what happens when you close your laptop. We’ve been frustrated countless times by shutting our laptop lids and forgetting that this automatically put them into sleep mode. Sleep mode works great in Windows 7, but sometimes you want your machine to keep running, so this is a great way to do that. Or, if you prefer to have your computer automatically shut down or hibernate when you close the lid, you can do that too. Since you can set the plugged in settings different from the on battery settings, you should be able to make your settings work for any scenario.